Raise your hand if you're an author who has ever complained that you don't have enough time to market your books. After all, you're too busy writing, right? While making time for larger book marketing efforts is a requirement and reality of self publishing today (or any publishing for that matter), there are still plenty of things you can do to promote your book when you're short on time. This week's free resource for writers is designed to help you stick with your book marketing even on your busiest days. 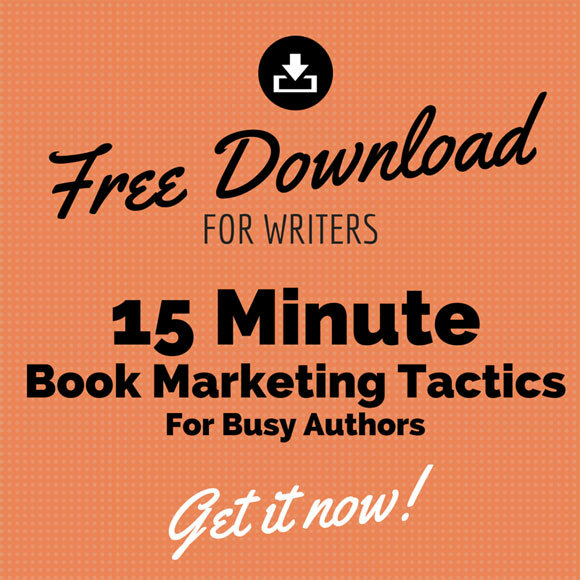 I've put together a simple list of 15 book marketing tactics that you can do in just 15 minutes. You can preview or download it below. Very nice tips for some of us who have been authoring but with limited time to market our books. I will try these tactics and share my results here. Seriously, you’re amazing. I love your content. It’s so helpful! Another marketing strategy I am trying (and I am brand new to all of this) is entering my self published book in several different book award contests such as the International Book Awards, the San Francisco Book Festival and the MWSA Book Review/Awards. The entry fee is relatively cheap ($40-$79) and even if my book wins only an honorable mention, it’s still great publicity.